Love This! - Dr. Scheller Pomegranate Shower Gel - Polish This! Here it is, the first post of my new post series here in Polish This! This new post series is going to be about other products I've tried and fell in love with. They can be other beauty and cosmetic products, sometimes hand and nail care products and occasionally even something completely different, we'll see. The series will simply be called Love This! and you'll find all the post of this series with the same Love This tag. The basic idea is just that I want to recommend some great products for you guys. You can probably see that I've been planning this new series for quite a while, since these first post pictures are quite summery. Maybe they are a nice little breeze of summer in the middle of December..? The first product of this series is quite simple one, but still an awesome one! 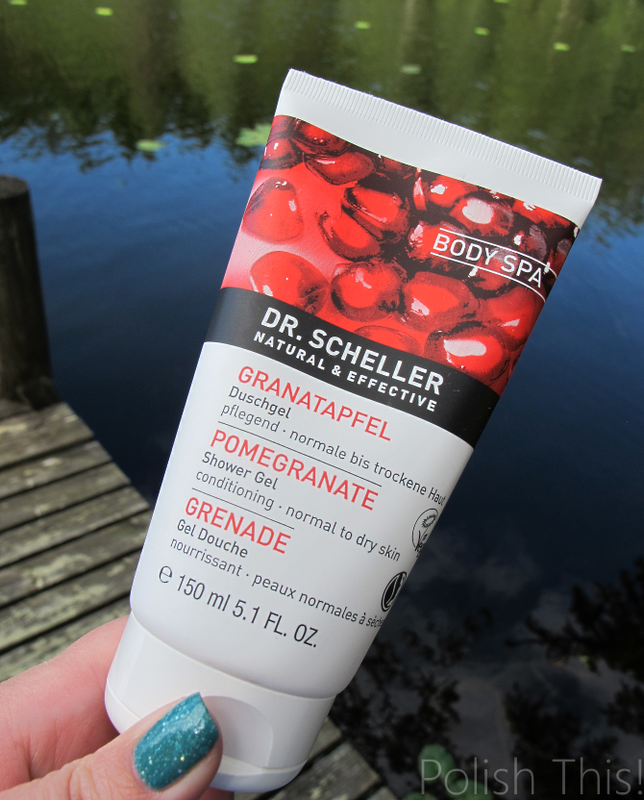 It's Dr. Scheller Pomegranate Shower Gel that I received from a goodie bag already in last spring. Eventhough the pictures are quite summery here, I'd say this fits to the current season also, as it's the best pomegranate season right now. If I'd had to choose one favorite fruit it might well be pomegranate, I love them! I'm not sure if the scent in this product is completely accurate pomegranate scent, but it's nearly there. I do like the scent, it's clearly there, but it's not too strong. The one thing I love most about this shower gel and the reason I wanted to post about this and recommend this to you, is the fact that this is really gel-like and because of that, it works perfectly as shaving gel used with razors. 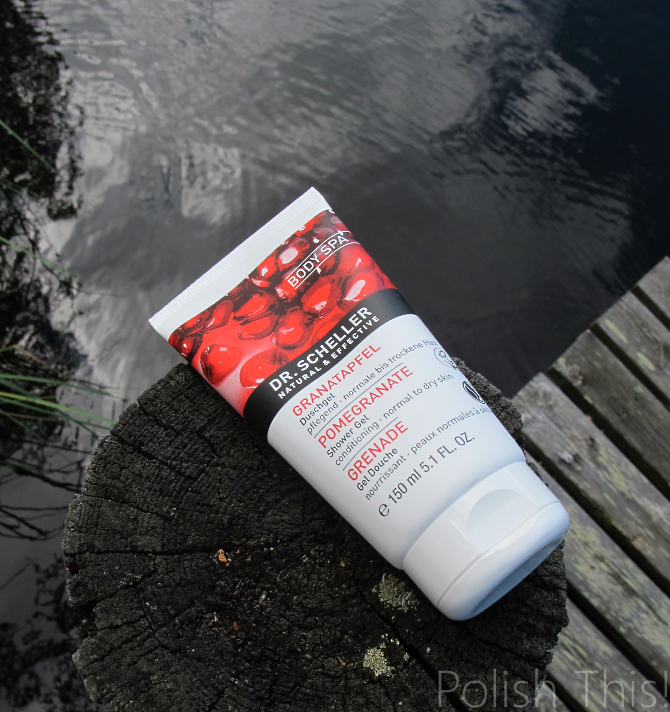 It is THE feature that makes this Pomegranate Showe Gel really awesome. I for one don't usually buy any shaving gels or foams, I just use my current shower gel for shaving. Most of them work for this quite well, but I thought this Pomegranate Shower Gel worked like it was meant for it. It's not only gel-like, it's also makes the skin feel quite slippery when you have it on you, so it truly works perfectly for shaving. It's also a great shower gel as doesn't dehydrate you skin and of course a big bonus is that this is all natural product. 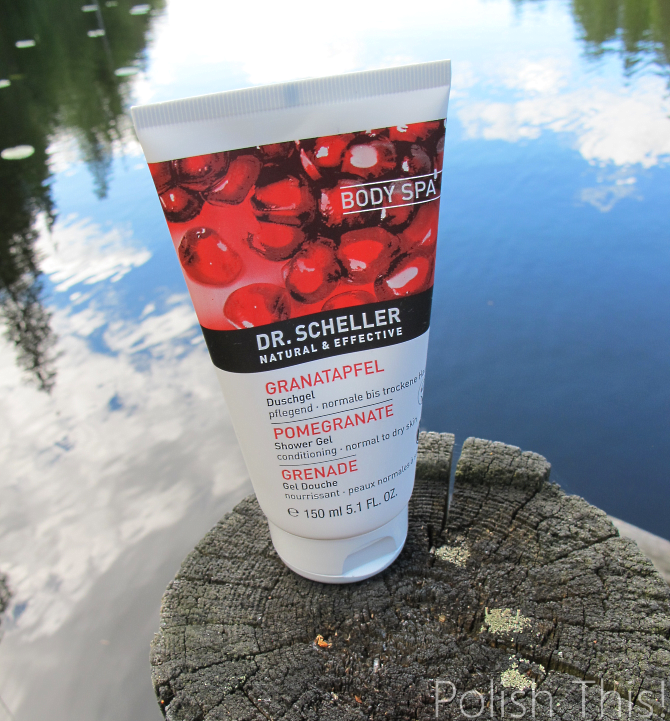 All the Dr. Scheller Pomegranate series products have pomegranate extract in them which has a conditioning, clarifying and light pore-refining effect. Dr. Scheller products are BDIH certified natural by German standards and they are all vegan. Oh, and in case you were wondering, the nail polish that you can see a glimpse on the one picture, is KBShimmer Home Surf. I hope you liked the start of this new post series. I will be doing these every other Saturday from now on. These pictures made me definitely long for summer! How about you? *I've received the product in this post from a goodie bag of a beauty blogger event.